Flying Eye Books, 9781911171614, 32pp. What could a young girl and a penny have in common? They both have enormous dreams! Emma practices tirelessly to become a great diver, but as competition day approaches, her nerves get the better of her, and her confidence begins to wane. 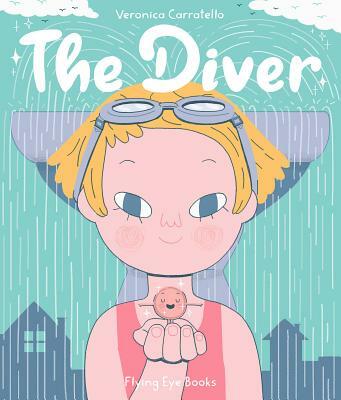 When she picks up a penny for good luck, she has no idea that this little copper coin has dreamed of becoming a diver for his entire life! With a lot of hard work, a little luck advice from Dad, and one big wish, Emma and the penny both live their dreams in their own ways. In this humorous story, we learn that anyone can accomplish their dreams, no matter how small they are, if they practice and aren't afraid to jump. Veronica Carratello is an illustrator and comic book artist. Her charming and colorful work can be seen in projects for clients such as Netflix and Circolo dei Lettori. Veronica's experience with comics has given her great skill in visual narrative and a unique approach to children's book writing and illustration. She lives in Novara, Italy. "[The Diver] is nevertheless executed with apparently perfect sincerity. [...] Odd but sweet."